What a great way to celebrate Chocolate Storytime’s one year anniversary! 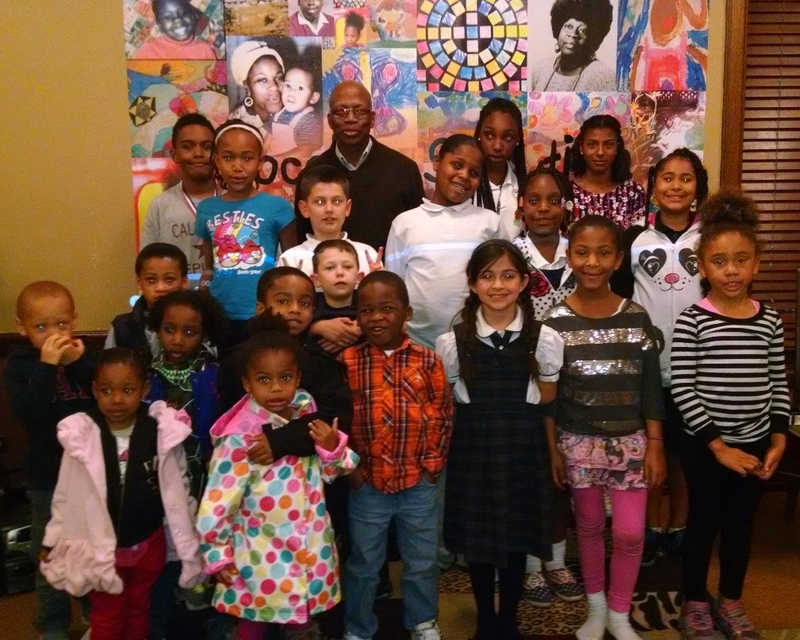 The culmination of Black History Month 2015 was an exceptional Chocolate Storytime lineup of artists, musicians, and special guest, Mr. Jarvis Emerson, Community Services Supervisor of the City of Pasadena’s Jackie Robinson Community Center. 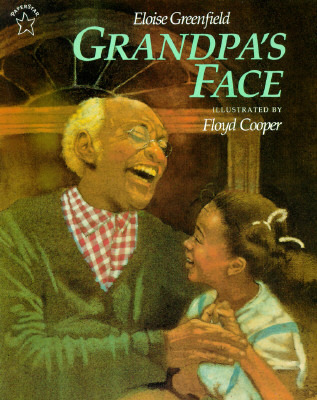 Mr. Emerson made himself comfortable on the rug and read Whose Knees are These?, Grandpa’s Face, and a beautiful poem, Dream Variations, about the freedom of dance and the beauty of rest by Langston Hughes. The kids were very attentive as Mr. Emerson engaged them with little anecdotes and in dialogue about the stories. Mr. Emerson has deep roots in community service, as former director of the school board health clinic and youth services for the Watts Health Foundation, director of the Save Our Sons program for the African Methodist Episcopal (AME) Church, Southern Conference, and Field Representative for Assemblyman Anthony Portantino. In 2013, Mr. Emerson was honored by Zeta Tau Chapter of Omega Psi Phi fraternity, Inc., and was presented the Chapter’s Citizen of the Year award by Immediate Past Basileus William C. “Bee” Thomas. The Citizen of the Year award is given each year to an individual from the community whose work has contributed to the stalwart uplift of their communities. 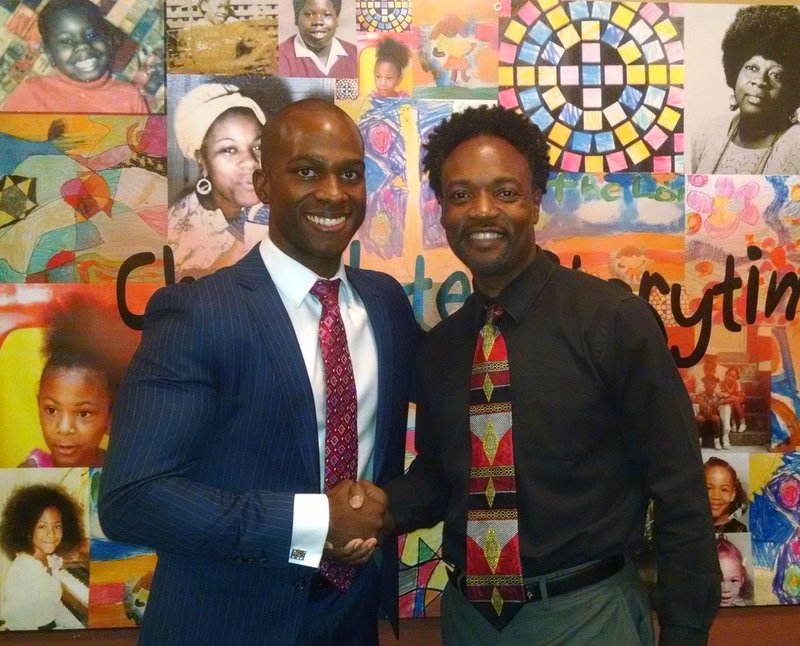 Mr. Emerson has also been the director of the city of Pasadena’s annual Black History Parade and Celebration, one of the largest in California, for nearly a decade. Mr. Emerson’s love for community service and bridge building is demonstrated in his passion for and dedication to the people in and around the Jackie Robinson Community Center. Responsible for orchestrating the program’s schedule of student talent and special guests, making this month so memorable, is community activist, classical pianist, community talent agent, and entertainment etiquette trainer, Ms. Betty J. Ford. She invited a bevvy of individuals from the community to participate in this month’s story time. Kenneth Thomas, Jr.–a student from San Rafael Elementary and at after-school enrichment program, Aspires West Pasadena–recited an ancient Chinese Proverb, reworded by Ms. Ford, “Be Aware of Your Thoughts, They Become Your Destiny.” With her art work and custom stationery on display and available for purchase, young entrepreneur, Elyse Sharp, a sophomore at John Muir High School, gave a mini talk describing her creative art making process. Sharp also presented a cute and smartly edited community service announcement video that she created in 2012 about pet adoption. Seiji Mitchell played a snazzy jazz piece on the alto saxophone that had the audience bopping to the beat. Dr. W.H. and Mrs. Ranza Trotter, pastors from Pasadena’s Morning Star Missionary Baptist Church traveled from their home in Ladera Heights to enjoy the program. Tyron Hampton, Pasadena Unified School District board member and Pasadena City Council candidate, congratulated the student performers and expressed his fondness of story time as he is a new father himself. Actor, producer, and playwright of stageplay, A Fight for Love, Jose Turner, attended with his two beautiful children. Parents from San Fernando Valley’s, Parents of African American Children (PAAC), also visited. 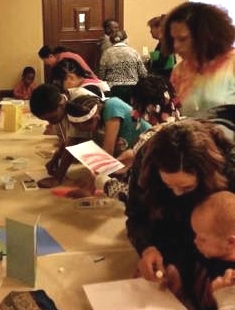 Armory Center for the Arts facilitated a drop-in art workshop. Much gratitude goes out to all of the volunteers and partners for this month’s special story time! A big thank you goes out to the library staff of La Pintoresca Branch Library: Branch manager, Pat Smith; librarians, Rosa Cesaretti, Jessica Viray, and Darryl Banton; and Léeme un cuento, Spanish-language story time leader and librarian, Lupita Barajas. Also, thanks to both of the staff members who help to set up each month. Lilia Hernandez, Director of Community Programs from the Armory Center for the Arts organized this month’s art activity and was a pleasure to work with for this special anniversary story time. Thanks to San Rafael African American Parent Council parents Staci Mitchell, Sabrina Gray, and Nacole Johnson and grandmothers, Jackie Johnson and Barbara Lindsey for their volunteerism and help this past year. Also a special thank you to Miguel Endara and his wife Nora de la Torre from Nora’s Music Class who, over the year, took time out from their weekly music program to bring their daughter and students to visit and help set up and clean up. Cheese and crackers, veggies and dip, chocolate treats and sweet potato pie from 27th Street Bakery were all donated by retired school teacher, Barbara Lindsey. Ms. Lindsey was also in attendance–all the way from Inglewood–helping to set up the food and work with the student talent. Pasadena residents Laniece and Krystal Dickson donated 4 dozen of delicious and beautifully decorated chocolate frosted cupcakes. And Ms. Ford blessed the anniversary event with a three-layer chocolate cake for all to enjoy. Chocolate Storytime is on the last Friday of the month at 4:00 p.m. in the Community Room of La Pintoresca Library. For pictures from the latest Chocolate Storytimes and activities, visit the Photo Albums tab. 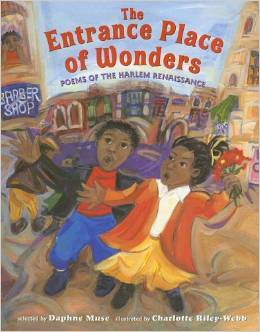 Because of the special Black History Month program at Chocolate Storytime, the Mary McLeod Bethune Urban Book Club will meet in March. They will review chapter book, The Lion, the Witch, and the Wardrobe by C.S. 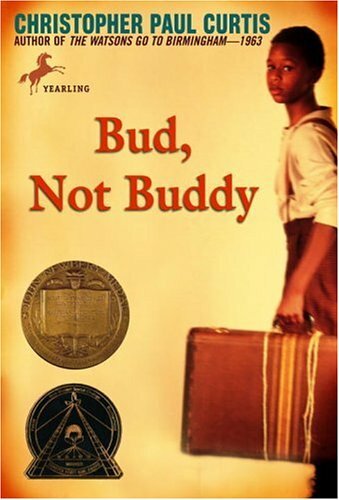 Lewis, as well as this month’s book Bud, Not Buddy (in English and Spanish) by Christopher Paul Curtis. 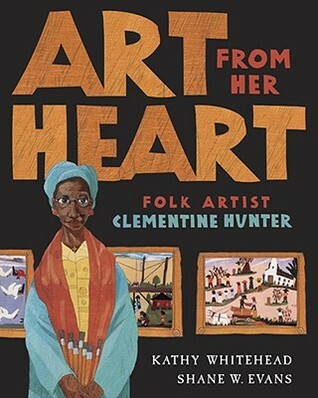 The Bethune Book Club is sponsored by the San Rafael Elementary School African American Parent Council (AAPC) and meets the last Friday of every month, from 5:15 p.m. to 5:45 p.m., following Chocolate Storytime. 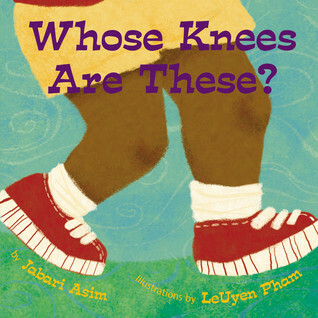 Below are the books that we read at this month’s Chocolate Storytime. 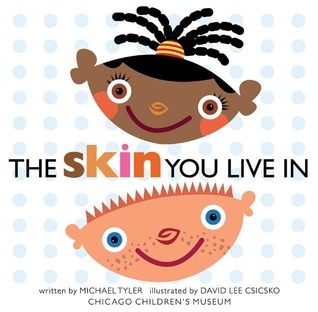 Ms. Ayesha read the first two books and Mr. Emerson read and read from the rest. Some of the books have been purchased from Eso Won Bookstore in Los Angeles or Vroman’s in Pasadena, or checked out from the La Pintoresca Branch Library.